[UPDATED 3X] iOS 4.3 Beta 1 Now Available! 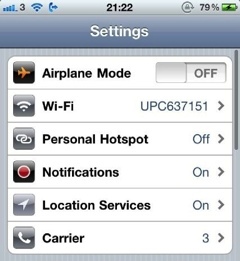 [UPDATE] The new HotSpot feature is indeed on the GSM iPhones in iOS 4.3! screenshot below! [UPDATE 2X] Apparently, you can multi-task using multitouch now! [UPDATE 3X] The iPhone 3G & iPod touch 2nd Generation will NOT be receiving iOS 4.3 or anything else. Hey guys, looks like rumors and leaks about iOS 4.3 are 100% true. iOS 4.3 brings a bunch of new functionality. The main new functionalities are mostly AirPlay related. Now, developers will be able to take advantage of AirPlay APIs and put them into their 3rd party applcations. [UPDATED] Also, the HotSpot tethering feature IS in this build. Also, the build number for iOS 4.3 beta 1 is, in fact, the build number that was leaked to BGR earlier today. Also, iOS 4.3 adds 4 & 5 finger gesture support for the iPad! iOS 4.3 beta is available for iPad, iPhone 4, iPod touch 4th Gen, Apple TV 2nd Gen, iPhone 3G [S], and iPod touch 3rd gen.
Is there a way y’all can test the hotspot? Also does this mean mywi can update to add more than just ad hoc connectivity using this new unlocked feature, maybe now the ps3 can get online using the iPhones network?!!!?? You can reply in email. I understand, that would be great to know. Keep us updated, also does the finger gestures work with iPhone, I’d imagine not though. I can’t see myself using up to 4 fingers on this screen. I may update to check it out. Although I dont really want to lose my jailbreak. If you want to be a beta tester all we require is a minimum of a $10 donation to join our team! Don’t upgrade if you’ll lose your jailbreak, and I would love to be a tester but I rely on MyWi 4.0 to get my MacBook Air online for college. Also another reason I wish MyWi supported the PS3 to get it online. The air doesn’t have an Ethernet slot so I can’t bridge the connection either. I may update this weekend, so if we dont get any news on it by then, I will have it for you. I’m a tester but am looking for step by step instructions to get it to upgrade? I downloaded it but nothing happens. It seems like I’ve opened those dmg files before with windows. Make sure you gave Mike your iTunes email/Apple ID or it won’t work. Apple needs an email to associate it with that currently has an account.